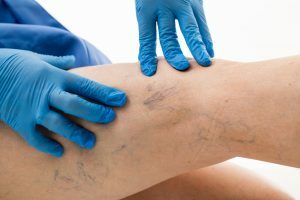 A superficial vein can become varicose, which refers to it as taking a twisted or enlarged appearance. They also tend to be dark purple or blue in color. Typically, they occur on the legs, but they can develop anywhere. Besides varicose veins, you can also develop spider veins. These are not as enlarged and often have a web-like look that can be red or blue in color. Achy or heavy feeling in the legs. Burning, throbbing, cramping, or swelling in lower legs. Skin discoloration around a vein. Varicose veins result from weak or damaged valves. Your arteries carry blood from your heart throughout your body. Your veins allow your blood to return to your heart for recirculation. Since the veins in your legs must work against gravity, if the valves do not function properly, it causes your blood to flow backward. This can make the veins look stretched and twisted. Often, the abnormal veins are only a cosmetic issue, but they can lead to certain complications, like ulcers and blood clots. You can reduce your risk of future problems and improve their appearance with sclerotherapy. Sclerotherapy reduces the visibility of unsightly veins by injecting a special solution into them. It creates swelling to restrict the blood flow when it comes in contact with the blood vessel. This causes the vein to collapse and shrink. You will see the vein diminish over the next several weeks to give you lasting results. This is a minimally invasive and effective solution will help you overcome your insecurities when showing your legs. You will enjoy the results you want quickly without any downtime. You can feel confident when wearing shorts or skirts because you will not need to worry about unsightly veins. Sclerotherapy will help you achieve your desired results without surgery. Dr. Connie Casad is board certified in obstetrics and gynecology. She helps her patients look and feel their best using the more preferred treatments. She treats varicose and spider veins with sclerotherapy. Contact our office today to see if it is the right option for you.